Cook ground venison meat mixture on medium to low heat with diced onion and Hi Mountain Chili Seasoning until the meat is thoroughly browned. Add in the remaining ingredients. Simmer on low heat, stirring occasionally. Simmer at least 30 minutes before serving. 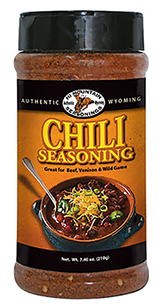 NOTE: During the cooking process, add water to the level of your individual liking for chili.